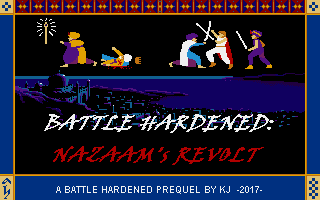 Description: "A prequel that focuses on the Battle Hardened 2 villain Nazaam. You play a new hero, Shahreemaan. Linear levels, easier than the earlier trilogy." new comments and replays. comments: really interesting new game, but I guess there's something missing or wrong in Level 3. 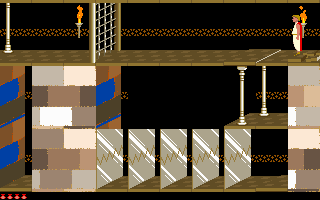 I discovered tricks: use first skeleton awake to push down a tile on a button that opens a gate, but then, the level is not complete: miss the room with the door to pass at the next level!!! I watch all over it with H - J - U - N to watch all the rooms also after the gate closed by the button jumping in!! I'll give you a tip : there's a checkpoint in level 3. I don't know what you're referring for, but I've got a big prblem now: all the levelsets are disappeared today from the Total Pack 3.0 on my PC and I don't know why. Remains only the first, with the original game. 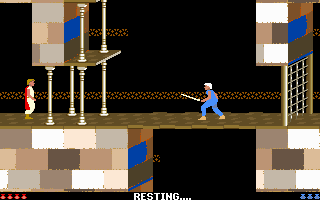 Trying to opening Total Pack it says "Could not convert variant of type (Null) into type (String)" then it opens showing only Prince of Persia 1 - Original and it's not even possibile installing the others!! What the hell it happened??!??? A new version of Total Pack is likely to arrive in the near future. It should fix this and other problems. Author here. As mentioned by nuzbunt, you need to die after that last gate. This indeed utilizes the checkpoint event and you respawn someplace else. 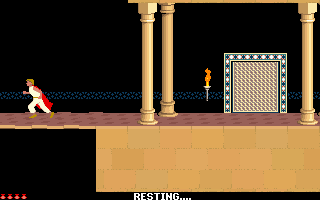 This is a little different from Repetition of Time's level 3, where you must press ctrl+A to respawn. It's easier to die, then press Enter, and you should respawn in room 2. There is also a document hosted by Norbert about special events in Popot here. Thanks for the info KJ. For the moment I can't play anymore until the new Total Pack arrives. I'm so destroyed because 3.0 doesn't show the games anymore. 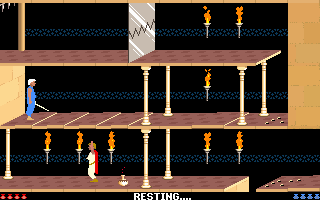 I could still play it by the zip but doing this can't regulate the format of the screen and can't use special commands to watch all the rooms and doing other things I like. If you download and unpack the ZIP, you could add to the directory a "PRINCE.BAT" file with the text "prince.exe improved" in it (without quotes). 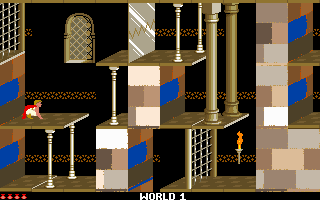 Then if you double-click that PRINCE.BAT to start the game, you can use special commands to watch all the rooms. It might take a week or more for Total Pack to be fixed. Hint: There is a blue potion that isn't a poison potion but something else. Use it and you should battle the 1st skeleton (or in this mod, a purple character I custom-made). Pushing him correctly is essential in progressing this lvl. Also don't mind if you died after a particular last gate, it is intended/"scripted". Chat codes in this episode? The "megahit" doesn't functional! until Total Pack is fixed. Thanks Norbert, but I've already got this emulator. I use it for both Prince 1 and 2, (but it's not good like Total Pack).